The Pharisees had usurped the positions whereby they could run the Temple. The Law of Moses never spoke of Pharisees. Only worthless people seek to lord over others, for worthy individuals are too busy in useful tasks to seek such places of authority. Jesus knew what the Pharisees in the Temple were thinking and speaking about. Typical of religious leaders, they were only concerned with their own power and making money. Temple religion had become big business. They could not afford to have their luxury threatened by a poor, wandering preacher like Jesus. Jesus, as the Messiah, could discern thoughts. This was the sign of Messiah. Only God knows our human thoughts. Messiah was "God with us" -- Emmanuel. A Man who could discern human thoughts. The Pharisees were Jews who ran the Temple worship in Jerusalem, in Judea, which was the homeland of the Jews. Jesus was not popular with the religious leaders of the Temple. Jesus never said anything polite to the scribes and Pharisees, but often called them hypocrites. If that is how Jesus described the Jewish religious leaders at His first Coming, what will he have to say about the church leaders at His second Coming? So Jesus was not wanted in Jerusalem, which was the headquarters of the Jewish faith. Jews also lived in Galilee where Jesus began calling His disciples. Jesus had already demonstrated the sign of Messiah in Galilee to Nathanael, a Jew, by revealing the thoughts of his heart. Jesus knew what kind of person he was, and even where he had been earlier that day and who he had spoken to, though they had never met. JOHN 1:48 Nathanael saith unto him, Whence knowest thou me? Jesus answered and said unto him, Before that Philip called thee, when thou wast under the fig tree, I saw thee. JOHN 1:49 Nathanael answered and saith unto him, Rabbi, thou art the Son of God; thou art the King of Israel. Having his thoughts and character and previous actions revealed made Nathanael, a Jew, recognize his Messiah. But Jesus was not interested in the thoughts of the Pharisees in the Temple. They had rejected John the Baptist, and only left John alone because they were scared of the people who thought that John was a prophet. :31 And they reasoned with themselves, saying, If we shall say, From heaven; he will say, Why then did ye not believe him? :32 But if we shall say, Of men; they feared the people: for all men counted John, that he was a prophet indeed. But Jesus had also chased the money lenders out of the Temple, and since then the Pharisees had hated him. Interfere with a religious leader’s income and you earn intense hatred. But Jesus was not impressed with wealth. LUKE 6:24 But woe unto you that are rich! So Jesus knew that the Pharisees had rejected Him too, especially as He was even more successful than John. It is difficult to operate in a region where the religious leaders are vehemently against you. People listen to their church leaders before they listen to the Bible. Thanks to our church leaders of today, the average Christian knows very little about the Bible. Jesus never actually baptized anyone. Baptism was just pointing towards His future death, burial, and resurrection. Religious leaders insist on baptizing converts to show their importance and superiority. Jesus never took that approach. JOHN 4:3 He left Judaea, and departed again into Galilee. So rather than stay and eclipse the ministry of John the Baptist who was operating amongst the Jews in Judaea, Jesus decided to rather go to the Jews in Galilee. In addition, the opposition of the Pharisees would make it difficult for the Jews in Judaea to listen to him. When a pastor condemns a person, the whole church automatically condemns that person. In a modern church, the people catch the spirit of the pastor, making them second-hand Christians. Even though it was mid winter time and inconvenient for travelling because of the intense cold, Jesus set off on the long walk to Galilee. Obeying God's will requires sacrifice. 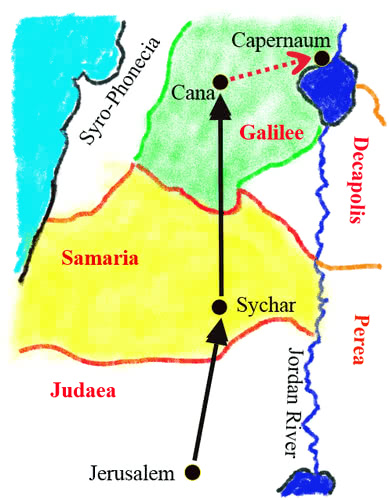 But in between Judaea and Galilee was Samaria. JOHN 4:4 And he must needs go through Samaria. The Samaritans were a mixture of Jews and Gentiles due to intermarriage. Most of the original Jews from Samaria had gone into captivity under the Assyrians, and never returned because all they had to worship was the golden calves in the cities of Bethel and Dan. They had forsaken the true worship in the Temple in Jerusalem. Once they went into exile they just faded from history. A false religion cannot bring people back to the truth. The Assyrian empire started in the red region as shown on the next map, and expanded into the green section. This included the yellow portion of Israel. The few Jews who remained in the yellow portion of Israel intermarried with the Gentiles who were moved into this area by the Assyrians. 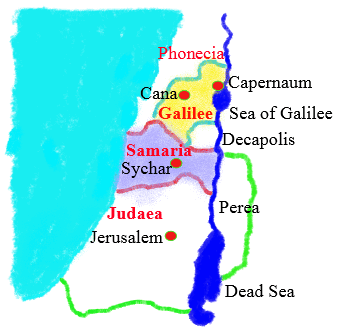 This yellow area became known as Samaria and the Jewish-Gentile intermarriage produced a nation that were called Samaritans. The violet section of Judaea is shown below the yellow area of Israel. 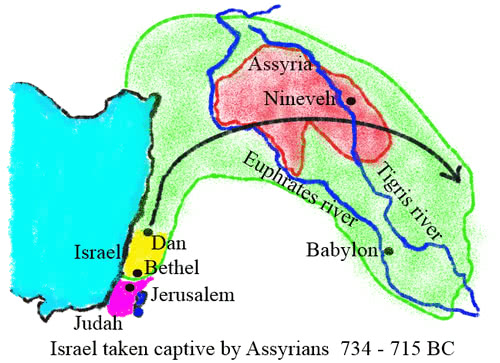 The Assyrians never took Judaea captive. So having left Jerusalem, Jesus first came to the city of Sychar in Samaria. JOHN 4:5 Then cometh he to a city of Samaria, which is called Sychar, near to the parcel of ground that Jacob gave to his son Joseph. JOHN 4:6 Now Jacob's well was there. Jesus therefore, being wearied with his journey, sat thus on the well: and it was about the sixth hour. Sychar is the Hebrew Aramaic root meaning "to be shut up". The well was a source of natural water, but the Samaritans were actually shut up from the true source of spiritual water which is the Holy Spirit. Sychar was in between two famous mountains where Joshua stood and had the Jews proclaim the blessings of serving God and the cursings of rejecting God. This was when Joshua marched in to conquer the Promised Land physically. Joshua was fit, strong, and tough when he stood at Sychar. But Jesus was very tired and had to sit down. He did not look at all like a tough conqueror. But He was on a much deeper spiritual march, to conquer sin, hell, and the grave. Then He was to conquer the world with the Gospel during the two thousand years of the seven church ages. 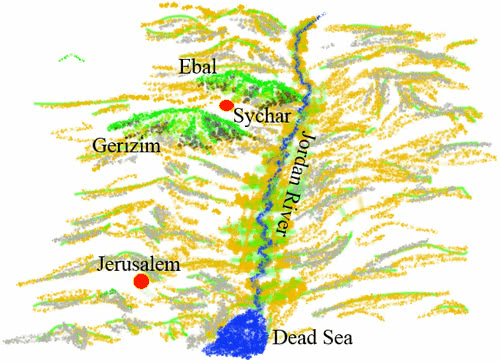 Mount Ebal is north of Sychar and mount Gerizim is south of Sychar. Ebal means distortion or heap of ruins. This is where the cursings were proclaimed as the results of any false beliefs. Gerizim was the source of blessings for those who obeyed God and only believe what is written in the Bible. The land of the Samaritans had been invaded by Assyria and occupied by them. This curse was caused by the worship of the golden calves that had been set up in Dan and Bethel. Now Jesus, in the presence of mount Gerizim was going to offer the Samaritans the blessings of eternal life which only the Holy Spirit could provide. JOHN 4:7 There cometh a woman of Samaria to draw water: Jesus saith unto her, Give me to drink. A woman symbolizes a church. The true church is the Bride of Christ. With this woman Jesus is going to illustrate His plans for the 2000 years of church history. That is His deeper plan. She was a sinner woman, but this indicated that church history would be devoted to God saving sinners. The disciples put the emphasis on the physical, while Jesus emphasized the spiritual. We Christians make the same mistake by seeking first our own material welfare rather than the will of God. JOHN 4:9 Then saith the woman of Samaria unto him, How is it that thou, being a Jew, askest drink of me, which am a woman of Samaria? for the Jews have no dealings with the Samaritans. Xenophobia, Racialism -- Dislike of other nations has been around for a long time. A Jew should not speak to a Samaritan. A man should not speak to a strange woman. Jesus broke both taboos to illustrate that God seeks everyone, whoever they are. The woman could see the natural Man Jesus. She could not see the supernatural God Who was hidden inside Jesus. Messiah means God walking around in a human Man. JOHN 4:11 The woman saith unto him, Sir, thou hast nothing to draw with, and the well is deep: from whence then hast thou that living water? She, typical of today’s churches that take the numbers of people in the congregation and the amount of money collected as proof of God’s blessing, could not see beyond the physical. JOHN 4:12 Art thou greater than our father Jacob, which gave us the well, and drank thereof himself, and his children, and his cattle? Jacob was a great name as he was the ancestor who gave his name Israel to the nation. Could Jesus be greater than Jacob? The answer was a resounding, "Yes". Jacob gave water to his children in a dry and arid region by digging a deep well. Jesus would have to dig down deep enough to carry our sins down into hell, and dump them on the Devil who is the father of sin, and thereby free us from having to pay for our sins in hell. Jesus would then have to dig deep into the hearts of His children who were in this spiritual wasteland, so that He could fill them with the living waters of the Holy Spirit. The golden calves of Samaria, and all other idols, require people to look after them. Idolators are people who have to care for their gods. Jesus was offering the Spirit of God, Who would enter a person and then look after the person. God caring for a person is a much better idea than a person caring for a god. JOHN 4:15 The woman saith unto him, Sir, give me this water, that I thirst not, neither come hither to draw. The woman was intrigued and wanted this living water. But she was wanting a religion from which she could gain personal convenience. She had to walk a long distance to fetch water and then carry it home. This new religion could save her a lot of effort if she did not have to walk to-and-from the well every day. She was guided by the wrong motives of self-gain. Too often we serve God, but our true inner motive is not just a love of God, but it is a desire for material benefits. This sets up a shallow relationship between God and us. Job had a much better attitude towards his God. So did king David, who refused to serve God if it did not cost him something. He was offered the threshing floor and the sacrificial oxen for free, but he insisted on paying for it. That was where the Temple was to be built. II SAMUEL 24:24 And the king said unto Araunah, Nay; but I will surely buy it of thee at a price: neither will I offer burnt offerings unto the LORD my God of that which doth cost me nothing. So David bought the threshingfloor and the oxen for fifty shekels of silver. JOHN 4:16 Jesus saith unto her, Go, call thy husband, and come hither. Jesus had to change her thinking. She wanted a belief that would save her a lot of walking. So Jesus told her to walk home and fetch her husband. JOHN 4:18 For thou hast had five husbands; and he whom thou now hast is not thy husband: in that saidst thou truly. Jesus said she had been married five times before and was now just living with a man. How on earth could a tired Stranger know all about her? Suddenly her mind moved into a higher gear. This Jesus had to be a Prophet of God. Someone that God spoke to. JOHN 4:19 The woman saith unto him, Sir, I perceive that thou art a prophet. JOHN 4:20 Our fathers worshipped in this mountain; and ye say, that in Jerusalem is the place where men ought to worship. The Samaritans were shunned by the Jews who worshipped in the Temple in Jerusalem. So the Samaritans had to worship in mount Gerizim. They had turned the mountain into their centre of worship. The woman did not know that the scribes and Pharisees in Jerusalem had rejected Jesus. Jesus warned her that a new day was coming when God would set up His temple in the hearts of men and women. The Holy Spirit dwelling in a repentant heart would be God’s throne on earth. That is how God would operate during the seven church ages. Jesus explained that the Samaritan worship was a waste of time as they had made up their own rules and declared their own mountain to be a place of worship. God is not impressed with human opinions and traditions. The salvation plan depended on the Jews. They had to crucify Messiah as the real Passover Lamb in order for Jesus to conquer sin and death. Church traditions would undermine truth. We were never asked to celebrate the birth of Jesus. 25 December was the birthday of the Roman sun god. Jeremiah chapter 10 said we should not decorate upright trees. Christmas is an unscriptural word. So we get it all wrong, and then call it the greatest church festival of the year. Churches take communion, the Lord's supper, in the morning. But it never was the Lord's breakfast. So man changes Scripture, and Jesus says this kind of worship, even if it is emotional and sincere, is nevertheless a waste of time. The Holy Ghost baptism that first fell on the Day of Pentecost introduced the three stages of the Spirit: repentance in order to get saved from hell, holiness, and belief in the supernatural manifestations of the Holy Spirit. JOHN 4:24 God is a Spirit: and they that worship him must worship him in spirit and in truth. God is not a material Being. So His main interest is the spiritual. God also expects us to know the truth of the written Scriptures. Ignorance or lack of interest in certain Scriptures does not impress Him. Claiming that there are mistakes in the King James Version of the Bible is proof that a person is not Spirit filled. The final proof of the Holy Spirit baptism is our ability to understand the written Word of God. JOHN 4:25 The woman saith unto him, I know that Messias cometh, which is called Christ: when he is come, he will tell us all things. The woman knew that there was a Messiah to come, and that the Messiah would know the secrets of the human heart. JOHN 4:26 Jesus saith unto her, I that speak unto thee am he. Nathanael the Jew had immediately recognized Jesus as being God in the flesh when Jesus revealed his thoughts and past actions. The Samaritan woman took a little longer to reach that same conclusion. But when Jesus told her Who He was, she suddenly saw the Light. JOHN 4:27 And upon this came his disciples, and marvelled that he talked with the woman: yet no man said, What seekest thou? or, Why talkest thou with her? The disciples returned and were also trapped in the physical realm, wondering why a Jewish man would talk to a Samaritan woman. They were unable to discern what was happening in the spiritual realm as her mind suddenly opened up to a deeper truth. Yet the Spirit of God was in full control and stopped the disciples questioning her. The Spirit even stopped the disciples asking Jesus why He spoke to a strange woman. Any interference by the disciples would have been disruptive so God just kept them silent. Evangelism is only successful when God is in control. The woman (symbolizing a church) had her own pot of personal beliefs that she had been taught by her religious leaders. Having met Jesus, the true Word, she rapidly abandoned her previous doctrines. The biggest barrier to seeing Bible truth is when church people try to hang on to their denominational beliefs. Now she went back into town and did something unheard of, she spoke to the men. JOHN 4:29 Come, see a man, which told me all things that ever I did: is not this the Christ? This Man had revealed her past and her present state. Five dead husbands, and just living with the sixth man. Now at last she had the Truth. She was no longer bound to men in a quest for earthly security and welfare. She no longer felt bound to the "church" group that she belonged to. She had met Jesus, and this set her on a new path where the focus was eternal security, even if she had to suffer in this life. PHILIPPIANS 2:12 ….work out your own salvation with fear and trembling. God’s will was suddenly far more important to her than her own convenience, welfare, and personal will. Jesus was using the local events to symbolize deeper truths that would echo down through the seven church ages. The church is in the seventh church age. Six church ages have passed and now, with the revelation of the seven Seals by the seventh angel or messenger, we are in the position where God’s Holy Spirit can guide us into the full understanding of the mysteries of the written Word. At last we can begin to understand what is written in Scripture. Now that six church ages are over, Christ the revealed Word can speak to us as He spoke to that woman. JOHN 4:30 Then they went out of the city, and came unto him. This is a spiritual insight. They had to go out of where they lived in order to find Jesus. In the seventh age Jesus stands outside the door of the church and knocks. Jesus only appeals to individuals in the church, not to the church as a whole. We need to come out of today’s religious denominational systems that are binding us to ignore much of the Bible, because the pastors in charge are also ignorant of what so many verses mean. Getting out of the ignorance and error of the church systems is the key to finding the truth of Scripture. JOHN 4:31 In the mean while his disciples prayed him, saying, Master, eat. The disciples again operated at the physical or natural level. They had money to buy food so they thought all was well. Modern church-goers feel the same. As long as God provides their physical needs, they feel that all is well. JOHN 4:32 But he said unto them, I have meat to eat that ye know not of. Jesus had His focus on a higher dimension. Spiritual meat that feeds the soul is Scriptural doctrine. I CORINTHIANS 3:1 And I, brethren, could not speak unto you as unto spiritual, but as unto carnal, even as unto babes in Christ. :2 I have fed you with milk, and not with meat: for hitherto ye were not able to bear it, neither yet now are ye able. Church goers cannot chew real spiritual meat. They cannot understand deeper doctrines. Ask them why Jesus twice wrote in the ground with His finger when men wanted to stone a woman, and they just give a blank, clueless look. Yet they claim to have the mind of Christ. But they have no clue what Christ was doing. So they are just fooling themselves. JOHN 4:33 Therefore said the disciples one to another, Hath any man brought him ought to eat? The disciples again reduced the spiritual insight into the future ages of the church, that they could not grasp, back down to the natural. Just like "church-goers" try to trivialize deeper issues. Eve ate a fruit and therefore got punished in childbirth? Really? They just give the usual blank stare of total ignorance and shun the person who asked the question. Why did Adam and Eve eat of the same fruit and yet get two different punishments? Why did God punish Eve in childbirth when that was a punishment that Adam could not share? Again the blank looks from church-goers who claim to have the mind of Christ, but do not understand what is in the Bible. God has a big Plan in our day. That is where our focus should be. We should not be obsessed with our material welfare, which is the same level that the disciples were operating at. God has revealed the mysteries of the seven Seals, and this should enable us to understand the Scriptures so that we can prepare for the resurrection of the dead by making sure that we believe what the first church believed. That is the main will of God for our age. God wants us to fulfill His Big Picture, and leave Him to look after the small details of our physical survival on earth. But we get it the wrong way round and focus our attention on our physical welfare, and ignore the difficult Scriptures that we cannot explain. That would cost us too much effort. We want the prosperity Gospel that makes our lives convenient and comfortable. And then we can also brag about our success of being great Christians because we are rich. Even though Jesus said it is difficult for rich people to get into Heaven. And if we do not understand many portions of the Scripture, who cares? Thus we fool ourselves. We make a virtue of evasion. People cleverly explain why we must not be able to understand a Scripture. Why a Scripture is "irrelevant". This evasion is then regarded as some kind of worthwhile achievement. No wonder the Lord Jesus stands outside the church. We must focus on understanding Scripture first. Then let God look after our physical lives. Now Jesus refers to a much deeper truth. JOHN 4:35 Say not ye, There are yet four months, and then cometh harvest? behold, I say unto you, Lift up your eyes, and look on the fields; for they are white already to harvest. The three main feast days of Israel are each associated with a different harvest. The barley ripens first around the time of Passover; the wheat ripens next around the time of Pentecost; and the grapes ripen last in the fall around the time of Tabernacles. Wheat and barley are sown in November and grow in a wet winter. The barley harvest can start with first fruits around mid April. That was the time of the Passover. Jesus was speaking at midwinter. Mid December to mid January (1 month) to mid February (2 months) to mid March (3 months) to mid April (4 months and the harvest is due to start around the time of the Passover feast). Notice, although it was midwinter, Jesus made no reference to a birthday celebration. We were never asked to celebrate His birth. The Bible never speaks of 25 December. That is just a pagan holiday for the heathen sun god. But the spiritual harvest was already ripe as Messiah had come in the fulfillment of prophecy, and if the Jews and Samaritans were prepared to accept Him, then the thousand years of peace would be shortly set up as God’s Kingdom on earth, where the Jews would rule the world. But Jesus knew that this would not happen because the Jews would reject Him. A harvest is when the seed is pulled off the plant. However, despite the Jews rejecting Him, the Old Testament saints would be pulled out of their graves in a resurrection that happened just after His resurrection. So the harvest of the Old Testament was these saints being pulled out of their graves, and then being pulled off the earth with Jesus on the Day of His Ascension as they went up to Heaven with Him (as a cloud of witnesses). Then Jesus looked into the future for the greater harvest at the end of the church ages. This was a bonus harvest. Because the Jews rejected Messiah, God was then able to turn to the Gentiles to save them. A harvest is when the seeds are pulled off the plants by the reapers. At the end of the seventh church age the dead saints from the seven church ages will be pulled out of their graves at the resurrection, and all the true believers will then be pulled off the earth to meet the Lord in the air. Jesus gets to the point. Those who fulfill God’s work on earth gain eternal life. That is the real reward. We may suffer on this side, but our reward is eternal life. Again, Jesus puts a focus on two parts of the crop cycle: the sowing in the first church age, and the reaping in the seventh church age. At the resurrection the first church age saints will rejoice with the seventh church age saints that have finally been restored back to the first church age beliefs. Now Jesus introduces a deeper concept: the seven church ages is symbolized by a cycle of planting the original seed. The seed has to be buried in the ground, and then the seed grows by stages into a plant that produces leaves and pollen and a protective husk around the developing seed. Finally the seed is ripe enough for the harvest when it is identical to the seed that was planted. The key point is this. The seed that is harvested is identical to the seed that was planted. Jesus is Alpha and Omega, the First and the Last. He is the Sower and the Reaper. The first church age sowed the Seed of the true Word of God as the apostles wrote it. Then the truth got lost and buried in the dirt of the Dark Ages. The Reformation of Martin Luther was the leaves sprouting. John Wesley preached holiness and outreach, which led to the missionary age, where the Gospel like pollen blew across the world. In 1906 the Pentecostal revival of the supernatural gifts was restored as a husk that looks just like the seed, but is empty as there was too much Scripture that they could not explain. In 1963 the mystery of the seven Seals was revealed so that the last age could finally return back to understanding the mysteries of God the way the first church understood them. The original seed Word of God would be restored by revelation to our human understanding. The mystery of God will be finished when the last age reaps the same beliefs, the same seed, that the first age planted. Jesus preached a parable on the labourers in the vineyard. The feast of tabernacles was during the grape harvest from the vineyards. The feast of Tabernacles represents the 1000 years of peace on earth (often called the Millennium) which happens after the battle of Armageddon. There the people will build their homes and live peacefully in them. MATTHEW 20:1 For the kingdom of heaven is like unto a man that is an householder, which went out early in the morning to hire labourers into his vineyard. :2 And when he had agreed with the labourers for a penny a day, he sent them into his vineyard. The penny represented the Holy Ghost baptism which gave them a place in the 1000 year kingdom. These first labourers represented the Christians in the first church age. MATTHEW 20:9 And when they came that were hired about the eleventh hour, they received every man a penny. :10 But when the first came, they supposed that they should have received more; and they likewise received every man a penny. :12 Saying, These last have wrought but one hour, and thou hast made them equal unto us, which have borne the burden and heat of the day. :14 Take that thine is, and go thy way: I will give unto this last, even as unto thee. These last labourers represent the Christians in the last church age of Laodicea. In this parable the emphasis is on the first age and the last age getting the same reward. The same Holy Ghost baptism that would reveal the first church age truths to the last church age. The children in the seventh church age would be restored back to the beliefs of the apostolic fathers from the first church age. MATTHEW 20:16 So the last shall be first, and the first last: for many be called, but few chosen. There must be no difference between the first church age and the last church age. God calls many to follow the revealed Scriptures, but most Christians prefer to stay with their church traditions and the opinions of their church leaders. They love church more than they love the Scripture. They regard the quotes of their church leader as being more important than the words of Scripture. The churches ignore God revealing the original truths from Scripture. They prefer to stay with their traditional man-made denominational beliefs. Only one age sowed the truth -- the first church age. Another age does the final reaping -- the seventh church age. Reaping is to pull the seed off the plant. The former rain is the teaching rain to enable us to understand the mysteries of God and be restored back to the beliefs of the New Testament. The latter rain is the harvest rain when the dead saints from seven church ages are pulled out of their graves, then the living saints are changed into immortal bodies, and then all are pulled off the earth as they are caught up to meet the Lord in the air. A big warning to us: Only one church age sowed the truth -- the first church age. The seventh or last church age must reap the same seed, the same doctrines, that the first church age had. JOHN 4:38 I sent you to reap that whereon ye bestowed no labour: other men laboured, and ye are entered into their labours. The last church age has no excuse. We only have to believe the doctrines that the first church age struggled, suffered, and laboured to establish.The apostolic fathers labored to write the New Testament and establish the foundations for the first church age. They struggled and were killed in order that Truth might be established. The Roman Emperor Nero began a brutal extermination of Christians in 64 AD. Around 300 AD the Roman Emperor Diocletion began a ruthless killing of Christians, as well as a very thorough attempt to destroy all the original Scriptures of the apostles so that Bibles were almost eliminated. Fortunately many copies had been made, so that some managed to survive. The rest of the church ages had to cope with much difficulty and massive persecutions. Tens of millions of Christians were martyred in the Dark Ages. Countless numbers died of disease or were killed on the mission fields. It has taken a huge struggle to get to where we are today. 47 skilled men translated the King James Bible in 1611. It was checked and revised for almost 160 years until the standard text of 1769 was produced. It was further checked during the missionary age as it formed the backbone of the missionary age. So all the hard work had been done to get an accurate translation into our hands. We have nothing new to contribute. The King James Version of the Bible is the most accurately checked Bible in circulation. We do not need to labour on a new translation. We cannot improve on the translation that has been done. We have to believe it as it is written, and make sure that we can understand its mysteries, because our responsibility is get back to the beliefs that the apostles had at the beginning. We can only reap what the apostles sowed. Consider the seven parables of the kingdom of Heaven in Matthew Chapter 13 that represent the seven church ages. The first parable had a sower of the true Seed Word, written by the apostles in the first church age. Only what the apostles wrote can be trusted. Evil birds tried to get rid of this seed. The second parable saw men get careless about staying with the written Scripture in the second church age, and weeds of human opinion and tradition entered the church. These errors would remain in the church, and only be revealed at the end when the mystery of the seven Seals would reveal the difference between truth and subtle errors. The third parable saw an unnaturally huge denominational tree grow, where the evil birds (who in the first parable tried to get rid of the Seed) sat in the top branches as the leaders of the church. Beware of human leadership in the church. This is the wrong system. The fourth parable, the middle parable or middle ages or Dark Ages saw a woman (the Roman Catholic church) dominate Europe. The fourth church was called Thyatira which means 'a dominating woman'. She made a Trinity of three Persons out of the meal or Bread of life. That rottenness spread until church goers no longer had one name for God. They swapped the name of Jesus Christ for the name of Father, Son, and Holy Ghost. But they cannot tell us what the name of Father, Son, and Holy Ghost is. They are actually titles. So the Christian God no longer has a name. The fifth parable showed Christ at Calvary buying the world, so that the Reformation of Martin Luther that preached salvation by faith could spread to everyone. The sixth parable showed Christ at Calvary buying a pearl, which represents a gate of Heaven. This was the open Door to the missionary age. Th seventh parable shows a net in the sea of restless nations and peoples. The internet travels to all nations, and can be used to reveal the mysteries of Scripture -- and then shall the end come. She recognized Jesus as the Messiah because He could reveal her thoughts and her past. The discernment of thoughts had been demonstrated to the Jews when Jesus spoke to Nathanael in Galailee. Then the discernment of her thoughts had been demonstrated to the Samaritans who were partly Jew and partly Gentile. This discernment of thoughts helped both Jews and Samaritans to believe, as it was the sign of Messiah. This prepared them for the first church age that was about to start when the Jews rejected Jesus, causing God to turn to the Gentiles. JOHN 4:40 So when the Samaritans were come unto him, they besought him that he would tarry with them: and he abode there two days. Jesus was laying a foundation with them that described the seven church ages. The seven church ages would last two thousand years, from the establishment of the first church by the apostles, to the final harvest or catching away to meet the Lord in the air. For 2000 years Jesus would walk in the midst of His church, which was symbolized by a seven-branched candlestick. In God’s time this would be two days, as God sees 1000 human years as a day. So Jesus was happy to spend two days with them. II PETER 3:8 But, beloved, be not ignorant of this one thing, that one day is with the Lord as a thousand years, and a thousand years as one day. One group, the Gentiles, were not introduced to the sign of the Messiah. So it will be no surprise if God raises up an end time Gentile prophet to take us back to the original doctrines of the apostles. He will also have to demonstrate the discernment of thoughts to the Gentiles. The people were impressed by what the woman (church) said about Jesus. But they were even more impressed when they listened to Jesus speaking. Jesus is the Word of God. So Christians tend to rely on what the church says about Jesus, and only learn the parts of the Bible that the church preaches from. But they would be far more impressed if they began studying the Bible for themselves, instead of always relying on what other people say about the Bible. "Church-goers" only parrot what their pastors say, and thus know very little about what is written in the Scriptures. JOHN 4:42 And said unto the woman, Now we believe, not because of thy saying: for we have heard him ourselves, and know that this is indeed the Christ, the Saviour of the world. This is the key point. You must believe in Jesus and study the Bible for yourself. Not because the pastor says so. You must have a personal conviction, a personal relationship with Jesus, that has got nothing to do with any church. These people had learned a fundamental truth. Reading the Bible for themselves made believing in Jesus far more meaningful than believing in Jesus because of what preachers say about Him. We all need to get a personal relationship with Jesus that is based on understanding the Scriptures. Church-goers today evade and avoid the difficult Scriptures because they never think for themselves. They just lazily parrot the quotes of some person, and avoid difficult questions as being unnecessary. They trust in human leaders to do their thinking for them, and are then limited in certain areas by the ignorance of those leaders in those areas. They are then also doomed to repeat their leaders’ mistakes. Thus they distance themselves from the Lord. People are not taught to get to grips with the Bible on their own. Thus they have no close relationship with the Truth like Jacob did when he wrestled with God. Our link must be directly with Jesus. Not a second hand link with Him that depends on a pastor. JOHN 4:43 Now after two days he departed thence, and went into Galilee. JOHN 4:44 For Jesus himself testified, that a prophet hath no honour in his own country. For some reason a prophet tends not to be recognized in his own country. This is a strange failure of our human thinking. Jesus was a threat to the religious leaders in their lust for power and money. Church-goers are stupid enough to believe their church leaders more than what they believe the Scripture. The Jewish leaders were able to persuade the Jews to crucify Jesus. The religious leaders were the main reason that the Jews rejected Jesus at His first Coming. Church pastors will be the main reason that churchgoers will reject the revealed Word of God at His second Coming. If the Jews had spent less time listening to the Jewish leaders, and more time reading about the Old Testament Scriptures that related to the ministry of Jesus, they would not have made such a bad mistake. If Christians relied less on repeating the quotes of their church leaders, and more time on searching the Scriptures for themselves, then we as individuals would have a much closer relationship with Jesus. Our personal relationship with Jesus is only as strong as our personal relationship with Bible truth, because Jesus is the Truth. If we say that a difficult Bible verse is not important, then we are saying that part of Jesus is unimportant. That means we have no deep relationship with Him. Everything about Him should be important to us. JOHN 4:45 Then when he was come into Galilee, the Galilaeans received him, having seen all the things that he did at Jerusalem at the feast: for they also went unto the feast. The Jews in Galilee were very impressed with Jesus. As Jews they had gone to the Passover feast in Jerusalem at the Temple and seen Jesus in action. They realized that He was exceptional. But they did not build up a personal relationship with Jesus. They did not regard Him as their only Head. They took the lazy way out and just had blind obedience towards whatever their religious leaders said. These Jews would never have condemned Jesus at the end if it had not been for the wrong advice that they got from their religious leaders. Their leaders, who were supposed to be preparing the Jews to receive their Messiah, were the very people who turned the Jews away from the Messiah. Religious human leadership is very dangerous. The leaders real love is for power and money. Deception began with the apostle Judas. Error starts at the top in the church, not outside the church . JOHN 4:46 So Jesus came again into Cana of Galilee, where he made the water wine. And there was a certain nobleman, whose son was sick at Capernaum. Jesus came to Cana where He performed the first miracle at a wedding, changing water into wine. His last miracle will be the preparation for the Wedding of the Lamb in Heaven ,when He changes the mysteries of the water of the Word into the wine of the stimulation of revelation as He reveals the written Word to His end-time Bride, before changing their mortal bodies into immortal bodies. Now Jesus wanted to reveal another aspect of the end-time miracle of preparing the Bride for the Wedding Feast in Heaven. The father was a nobleman -- a noble man. What made a person noble? They received the Word of God willingly and checked with Scripture to make sure it was true. ACTS 17:11 These [at Berea] were more noble than those in Thessalonica, in that they received the word with all readiness of mind, and searched the scriptures daily, whether those things were so. JOHN 4:47 When he heard that Jesus was come out of Judaea into Galilee, he went unto him, and besought him that he would come down, and heal his son: for he was at the point of death. This was an illustration of father and son. The father was noble, just like the first church age believers had been at Berea. A key idea at the end time is a prophet who will reveal the mysteries of Scripture at the end-time, and thus restore the end-time children back to the truths of the noble apostolic fathers. :6 And he shall turn ... the heart of the children to their fathers, lest I come and smite the earth with a curse. The curse is the lingering radiation of the nuclear bombs that will explode in the Tribulation. But before the Tribulation sets in, the children must be restored to the fathers. So the desperately sick child must be restored to the good health of his father, the nobleman. The last church age is sick with human leadership of the church that has got churchgoers to believe error, tradition, and human opinions. JOHN 4:48 Then said Jesus unto him, Except ye see signs and wonders, ye will not believe. A big problem with today's Christians is that they regard signs and wonders as more important than understanding Scripture. If they see a miracle they are convinced. JOHN 20:27 Then saith he to Thomas, Reach hither thy finger, and behold my hands; and reach hither thy hand, and thrust it into my side: and be not faithless, but believing. :28 And Thomas answered and said unto him, My Lord and my God. :29 Jesus saith unto him, Thomas, because thou hast seen me, thou hast believed: blessed are they that have not seen, and yet have believed. Miracles can produce faith. But better faith is produced by those who never saw miracles, because faith is built on believing the Word of God. Faith is not dependent on seeing miracles. Some people who have not even repented will produce miracles. Gideon had to listen to a dream an interpretation from the mouths of two pagans. :23 And then will I profess unto them, I never knew you: depart from me, ye that work iniquity. "the man believed the word that Jesus had spoken unto him": That was the key to his success. That was the attitude of the apostolic fathers to the words of Jesus. JOHN 4:51 And as he was now going down, his servants met him, and told him, saying, Thy son liveth. The son, at a distance, had been healed. The seventh hour is symbolic of the seventh church age where the end time children can be healed of their deadly unbelief gained in the church systems, and thus be restored to the faith of the New Testament that the apostolic fathers wrote. Jesus gave His Word to the early church fathers. We as children are far away in time and distance from the early church, but Jesus, at a distance, can heal our faith and make us believe just like the first church did. Jesus dealt with father and son at the same time. After the resurrection the first church age will appear to or visit the living saints of the seventh age, and they will agree or see eye-to-eye on doctrine. Then when the living saints have their bodies changed, both will be caught up together into the air. JOHN 4:54 This is again the second miracle that Jesus did, when he was come out of Judaea into Galilee. At the beginning of His ministry He symbolized the final miracles that He will perform at the end of the church ages. The first and the last miracles. The unchanging God who is Alpha and Omega, the Beginning and the Ending. Jesus Christ the same yesterday, today, and forever.